De Europese serie werd afgetrapt door Schotland en nu gaan we verder met Duitsland. 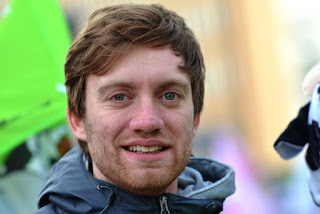 Hallo, my name is Andreas and I'm part of BUNDjugend, the German member group of the Young Friends of the Earth network. BUNDjugend was formed in 1984 as the independent youth organization of BUND. All members of BUND, who are younger than 27 are also members of BUNDjugend. Currently there are about 85,000 young people organized in a variety of groups and structures; from local groups in cities and municipalities to the Länder (states) level to the federal level. Together with seven other activists, I'm a member of the board on federal level. As diverse as the different levels are and as different as people from 0 to 27 are, our activities have to cover a wide range of interests. We have kids groups, who go outdoors to experience the joy of a natural environment and educate themselves about nature protection. We organise camps, travels and international exchange projects. And of course we are political activists: we do campaigns, actions and cooperate with other youth organizations like other environmental and social groups, youth unions and parties. As the federal board our function is to have an overview over all the activities, connect to other groups, organise protest and rallies, write position papers, build capacity in our structures, educate ourself about sustainability and all the other stuff, that makes activism exciting. At the moment our main focus is on topics around climate change, how the world could deal with it in equitable and just way and what the outcome of the Paris Climate Summit means. Food and agriculture is always an important issue to us as it affects equally people, the environment and biodiversity; every year we are the loudest and most colourful group on the “We are fed up!”-march, where about 20,000 farmers, bee keepers, environmentalists, and free trade critics march for sustainable agriculture. And of course TTIP and CETA are a very important part of our work. Last October 250,000 people from all over Germany came to Berlin to protest for fair trade and against free trade agreements. BUNDjugend formed there a block with other youth environmentalist groups and young unionists. We also work a lot on sustainable economics, degrowth and education for sustainable development and gained high profile in those fields across the German political landscape. Over 1 million refugees came to Germany in 2015. Together with other civil society organizations, BUNDjugend wants to open the heart of German society and our own organization for migrants and refugees to participate in. Given a political situation, where populist and nationalist parties gain ¼ of the votes in regions and even majorities in some places, we see it as our obligation to speak out against racism, sexism and other right wing tendencies. My main topic is climate justice. I went with Young Friends of the Earth at to the Climate Summit in Paris in December and met a lot of inspiring people from across the network and allies from all over the world, including the big network event on December 11th, where thousands of FoE-people and hundreds of Young Friends came together. At Lima in Brussels, where we followed the climate negotiations in 2014, I joined YFoEE's Climate Justice Working Group and went with them to the training event in Ireland and also the summer camp in Brittany. You might not see me at the pictures of those events, but that is because I'm making them. I'm part of BUNDjugend's working group on climate and energy, which we formed at the climate negotiation intersessionals in Bonn. I also work a lot on BUNDjugend's campaign strategy, build capacity for campaigns in our organization and plan a pilot-campaign for the second half of 2016. For JMA's 25th birthday BUNDjugend wishes you all the people, power and action that make YFoE the wonderful and inspiring network it is. Keep up your awesome work and see you in Europe!